인정문은 창덕궁의 중심 건물인 인정전의 정문이다. 효종·현종·숙종·영조 등 조선왕조의 여러 임금이 이곳에서 즉위식을 거행하고 왕위에 올랐다. 건물은 앞면 3칸·옆면 2칸 규모이며 지붕은 옆면에서 볼 때 여덟 팔(八)자 모양을 한 팔작지붕이다. 지붕 처마를 받치기 위해 장식하여 만든 공포는 기둥과 기둥 사이에도 있는 다포 양식으로 꾸몄다. 건물 안쪽 천장은 천장 재료가 훤히 보이는 연등천장이며, 단청은 가장 소박하게 꾸몄다. 왕위를 이어받는 의식이 거행되던 곳으로, 정전인 인정전과 함께 조선왕조 궁궐의 위엄과 격식을 가장 잘 간직하고 있는 건축물이다. 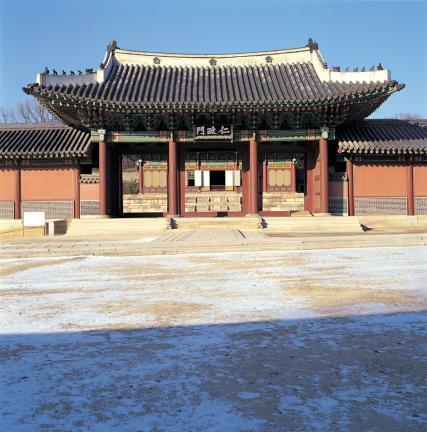 Injeongmun is the main gate of Injeongjeon, the main hall of Changdeokgung Palace. 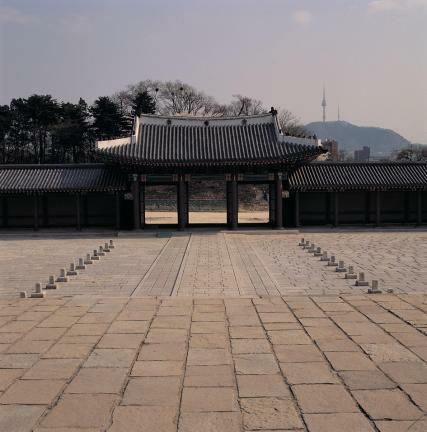 Many kings including Hyojong, Hyeonjong, Sukjong and Yeongjo of Joseon Dynasty held their coronation ceremony in this gate. Injeongmun Gate was badly damaged by a fire in 1744, but restored in 1745 and is handed down to this day. It is a one story building composed of 3-kan (a unit of measurement referring to the distance between two columns) front space and 2-kan side space. It has a hip and gable roof called paljakjibung. The gongpo that holds up the roof eaves on the pillars is set up not only on the pillars but also between them. This building style is known as dapo style. We can see all the rafters from the ceiling and its dancheong (a Korean style painting of many colors and design) is very simple. 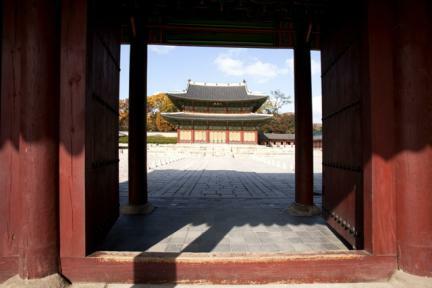 Haenggak, the gallery of the gate, extends at both ends. It retains a certain amount of Japanese style because it was renovated during Japanese Occupation. 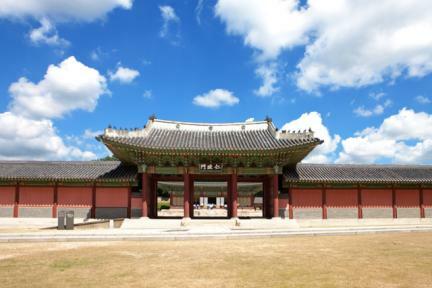 It shows clearly the dignity and majesty of the Joseon Dynasty, and along with Injeongjeon Hall, it is regarded as an important cultural asset.